You can find dozens of strategies and approaches to race nutrition with plenty of conflicting advice. Obviously more is needed and having covered diet in the run up to racing it makes sense to discuss race day fuelling. As with previous posts the emphasis here is long distance triathlon, things change a lot for Olympic distance and shorter. Unsurprisingly an Ironman places huge energy demands on the body. At Ironman New Zealand I’d estimate I expended 500 calories for the swim (I’ll admit I struggle with estimating calorific expenditure of swimming). My powermeter records around 4000 calories burnt during the bike (that was on the high side). A crude estimate of 100 calories per mile would add at least 2600 calories from the marathon. Over 7000 calories down in 9.5 hours of racing! The body’s most readily available store of energy is its glycogen and we hold 2000 calories in reserve at most. On race day I’m using 5000 calories more than is readily available. Fat provides longer term energy storage for the body and is easily capable of covering the deficit, but access to fat is a slower metabolic process heavily influenced by intensity of activity. With limited supply of immediate energy what does an athlete need to do in order to ensure they race successfully? Firstly any nutrition strategy is a personal thing, you have to discover your optimal solution during training and practice races. Underlying metabolic pathways are the same and during a long race you need to take in carbohydrates. It’s details like palatability and what you can process at race intensity that need refining. What happens if you don’t eat enough? I guess the answer is obvious. As the race progresses glycogen stores are emptying. The available energy fuelling you drops and the body attempts to make up the shortfall by releasing fat stores and converting them into glycogen. The process is slower and limited by intensity so at race pace the amount of fat burning can vary. If fat isn’t meeting the shortfall the deficit will grow. Well trained individual aim to be efficient at utilising fat stores at Ironman intensity. This metabolic efficiency is a limiter of Ironman pacing. Our objective is to get from start to finish as fast as possible, but we don’t set out at sprint pace. The body can’t support the intensity for that long, metabolic requirements are too high. Long distance endurance racing is a balancing act between intensity and our metabolism. At low enough intensity the body will cope on stored glycogen and body fat reserves. That’s not to say it’ll be comfortable, but the reserves are easily there. It won’t give you your best Ironman time though. As you up the pace fat metabolism can no longer keep up with the constant energy demands. Which is where fuelling comes in to bridge the gap and ensure there’s available glycogen to keep at our current pace. A sure sign of insufficient nutrition is a drop in performance or increase in heart rate and perceived exertion for a given effort. The race becomes harder than you expected, the initially easy bike pace is a struggle and you know you’ve worked harder in training! Pay attention to your mood as low blood glycogen can lead to mood swings and negativity. This one is a clear sign to me during races and acts as an early warning. It’s hard to distinguish this from fatigue over a long day! Try to compare with your longest training sessions, how did you feel towards the end of them? One of the reasons I like finishing endurance rides with harder efforts is the sense of performing when fatigued. You get a real idea of the impact of nutrition and fatigue on the body. Focussed training sessions with race pace simulations will make actual race performance easier to judge. Why not eat as much as you can? It might seem the sensible way to deal with the issue. We know we’ll be in deficit and we know that eating is a means of getting those calories. The ability to absorb nutrition decreases as exercise intensity increases. Diversion of blood to muscles along with increased levels of dehydration limit the activity of the stomach. Race intensity prevents us absorbing all the calories we’re expending. You will be in deficit. First time Ironman athletes often go overboard with food. It’s a perfectly understandable reaction to the day ahead and the knowledge of the energy it requires. We’re more aware of the dangers of bonking than the distress of over eating. Getting the balance right is essential to a successful race. Much as we need more energy part of a smart fuelling plan limits the intake of nutrition. Reactions to over eating are individual. Common symptoms include bloating and nausea with plenty of athletes who’ve been sick during a race. If you’re in this situation back off the intensity and take on water. The biggest issue is you’re not absorbing nutrition properly anymore. You probably aren’t keen to consume more and at worst you may empty your stomach of the fuel you have. Ironically eating too much results in an insufficient carbohydrates intake. Back the intensity off and there’s a chance for your body to catch up. Flushing some water through the stomach can help to clear the system. There’s no guarantee and if you find yourself here I’d advise a cautious approach. Easing up and trying to get on top of the situation will pay off in the long run. Stomach issues at their worst have major impact on race time, but dealt with early and it can be a matter of minutes. I’ve refined this over the past fourteen Ironmans. In my first race I was bloated and nauseous, had stomach distress and walked a fair bit in the last 10km! Recent races haven’t involved those issues and I’m happy I’ve found a strategy that works for me. I’d not advise adopting this wholesale, but it’s something you could trial before your next race. Following the principles above I aim for 250 to 300 calories an hour on the bike. This is the primary opportunity to absorb nutrition as relative intensity is lower than running and there’s less stomach agitation. Once I’m on the run course I drop down to around 200 calories an hour as it becomes difficult to handle more. Race day starts with a reasonable breakfast that’s quite high in protein and moderate in carbs. My glycogen stores won’t be that low thanks to the tapering and I find a higher protein content keeps me feeling full. I’ll top this up with a gel taken 30 minutes before the swim start. I can’t say how much that’s psychological, but it gives me confidence I’ll not have an energy dip in the swim! 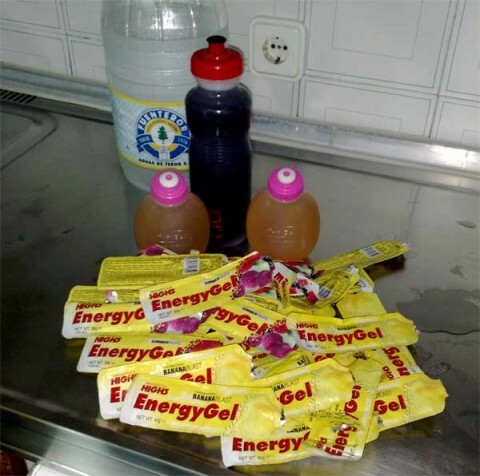 The entire race day fuelling strategy is built around gels. Early on in my Ironman career I decided that you have to accept race day food sources won’t be overly appetising. I opt for brands of gels I know work well to maximise palatability, but nobody chooses gels over real food in everyday life! I fill a standard 750ml water bottle with gels and slightly dilute as necessary. I’ll usually chuck in a bar or two in my transition bag or on the top tube. I find having a little bit of solids helps fool my stomach that it’s full. This should be all I need to eat for the bike, aid stations are there for water and alternative food in emergencies only. There’s common advice not to eat in the first 30 minutes of the bike so the stomach settles. I ignore it. Eat as soon as it’s comfortable, the swim has started the build up of calorific debt the earlier you deal with it the better. Once you’ve started keep a regular intake and a rough mental check on how much you’ve eaten. Always watch for signs of over or under eating and deal with it as early as possible. I’ll stop consuming solids at least an hour before the run just to ensure there’s nothing sitting in my stomach. I stick to the gel based fuelling right to transition with a bit more water in the last few kilometres. Avoiding gulping down too much as it’ll slosh around whilst running. All being well I’ve kept around the 250-300 calorie mark and my stomach is still feeling settled. Running is a continuation of the gels at regular intervals theme. I’ll time it around aid stations if they’re spaced well. Taking a gel on approach then grabbing water to flush it down. Usually I alternate taking a gel at one and then just water or a sip of energy drink at the next. With my stomach I have to avoid flat coke as it usually isn’t flat enough and leads to real GI distress! Regular feeding continues with a gel every 25 minutes or so until that last 10km. As I’ve described this is where I want to push the pace and raise intensity. We’re back to the absorption issue anything I consume will sit uncomfortably in my stomach. Nutrition take time to absorb so the easiest approach is to sip aid station energy drink at most. Once you’ve crossed the line feel free to fuel as you want!